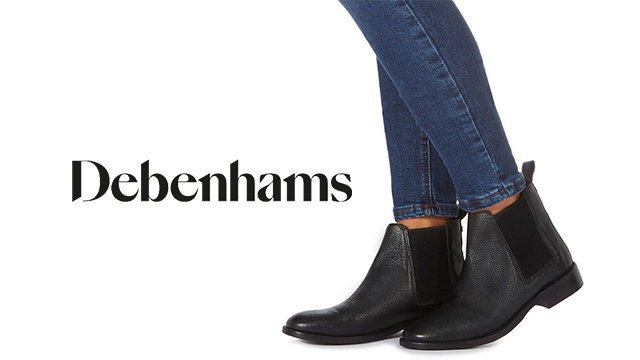 Debenhams is a leading international, multi-channel brand with a proud British heritage which trades out of over 240 stores across 27 countries. Debenhams gives its customers around the world a unique, differentiated and exclusive mix of own brands, international brands and concessions. Debenhams has been investing in design for over 20 years through its exclusive Designers at Debenhams portfolio of brands. Current designers include Abigail Ahern, Jeff Banks, Jasper Conran, Sadie Frost and Jemima French, Patrick Grant, Henry Holland, Betty Jackson, Stephen Jones, Ben de Lisi, Todd Lynn, Julien Macdonald, Laura Oakes, Jenny Packham, Ren Pearce and Andrew Fionda, Aliza Reger, John Rocha, Ashley Thomas, Justin Thornton, Eric Van Peterson and Matthew Williamson..